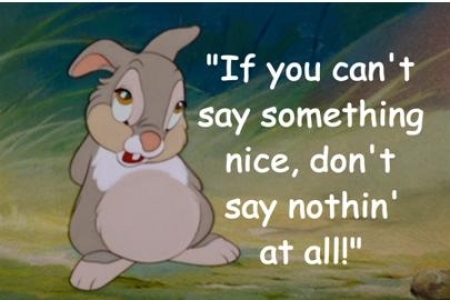 In Disney’s movie, Bambi, cute bunny Thumper is prompted by his mother to recite a bit of advice she’s probably repeated to him time and again : “If you can’t say something nice, don’t say nothin’ at all”. Although grammatically incorrect, it’s something every person has learned at one time or another: if you can’t say anything nice, it’s best to say nothing; silence is golden. I also believe that one shouldn’t write anything online that you wouldn’t say to a person’s face. Unfortunately the internet seethes with cruel and unkind comments from those who hide behind their computer screens, made brave by their anonymity. They are referred to as trolls. But that’s not what I’m writing about today. Today I’m going to address something closer to home. You see that photo, video or meme on your Facebook page, Twitter feed, etc. and think it’s funny or even disturbing. It might be of a woman wearing a tight costume or a fat man dancing shirtless. Chances are that the photo or video was taken without their consent like most of the ones on the People of Walmart website. Or it was taken from their own social media page by a troll with the intent of spoiling someone’s good time by making fun of them like the woman whose Lara Croft cosplay photo went viral with the words “Fridge Raider”. You have a chuckle or perhaps think “someone should have looked in the mirror before leaving the house”. Hey, we’re not perfect and our thoughts aren’t always kind. But the moment you express that thought on screen you add to the shaming. When you share it for others to laugh or cringe, you spread the troll’s hatred. This might sound harsh but I think of it as the online equivalent of standing by, laughing, while the bully pounds a little kid into the ground for his lunch money. You might think it’s harmless because you don’t know the person and they don’t know you. You’d certainly never say anything nasty or negative to their face if the opportunity should ever arise. But think about this: how do you know they’ll never see your comment or realize that you’ve shared their image? The internet is a lot smaller than you think. Think also about this: what if a troll took your photo or that of a loved one to make it a target of ridicule or harassment? Not so funny then, huh? So have a chuckle or cringe to yourself, if necessary. Then think of a cute, little bunny and say/write/share nothing at all.